Dawn Knox, where are you? 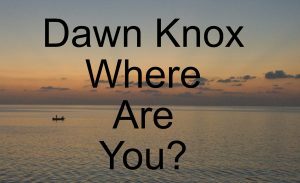 Where are you Dawn Knox? I’m not asking about me, obviously, I know where I am. 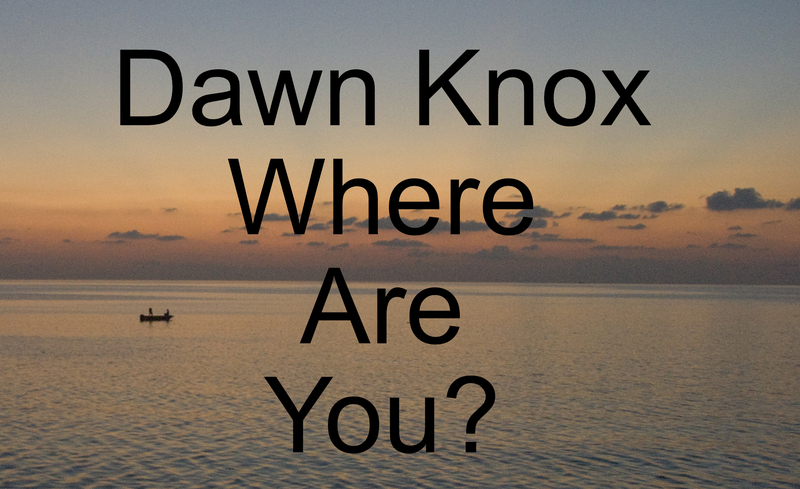 I’m looking for the other Dawn Knoxes out there – and I know there are quite a few. That’s very strange when you consider that Dawn isn’t exactly a common first name, nor is Knox a common surname. So far, I haven’t met another Dawn Knox, although in the school I worked in, there were three Dawns which seemed quite unusual. But I have met the husband of a Dawn Knox, on a diving holiday, so I know there are at least two of us Dawn Knoxes in England. Perhaps you know more? But over the last few years, I’ve been receiving strange emails to one of my email addresses. At first, I thought they were some bizarre phishing exercise – although, I couldn’t see what the angle of the scam might be since there were no strange links I was prompted to click on. Mostly, they were notification that I’d joined a loyalty scheme or informing me that since I’d bought a new three piece suite from a store in America, I might be interested in the matching sideboard, dresser or coffee table. Needless to say, since I live in the UK and have never bought a sofa nor chairs from a store in America, I don’t want the matching furniture, neither do I need a loyalty card from Australia. So, I ignored the emails, treating them as spam and didn’t click on anything. But just recently, I’ve received emails from Wallsend, North Tyneside; Red Beach, Aukland, New Zealand; Frankston, Victoria, Australia; and the states of Wisconsin, Massachusetts and Michigan USA – all supposedly to a Dawn Knox. So far, I’ve been reminded to make an optician’s appointment, prompted to pay outstanding school fees, informed I now have access to a college portal and urged to log in immediately, warned my child hasn’t handed in her homework and asked to pick up a child from school – all in America. I have been warned that a fast food meal is on its way to my house from Wallsend. And apparently, in March, I had a beauty parlour appointment for Botox and other fillers – in Australia… To name but a few. I think the problem is that when I selected a name for my email account, I didn’t use a number. So, the other day, I wrote an email explaining that I was obviously receiving mail for other Dawn Knoxes around the world and sent them to my email address but added numbers. Three of them bounced back because they weren’t actually email addresses and the others? Well, I have no idea. Certainly, no one replied. I expect those other Dawn Knoxes around the world thought the email was some sort of elaborate phishing scam. So, if you’ve stumbled on to this post and your name is Dawn Knox and you live in any of those places I’ve mentioned, please check with anyone from whom you should be receiving emails – and aren’t, that they have the correct email address. And if you want to get in touch, This is where you can find me.